It’s back!! In honor of National Poetry Month, Village Books and the Colophon Café are pleased to be teaming up with local poet extraordinaire Dee Dee Chapman for the return of the Write Riot Poetry Slam. This is a free, all-ages event (expect some adult language). Watch for updates on Write Riot’s Facebook event page. Seattle Poetry Slam is sending a team to the National Poetry Slam in Chicago to compete against teams from 96 other cities. Last year, Seattle Poetry Slam placed in the top 25 teams (of 96) and the year before in the top 20! On Tuesday, July 31, 2018, the 2018 Seattle Poetry Slam National Team (Rio Chanae, Ben Yisrael, Ebo Barton, and Garfield Hillson) will showcase their competition poetry at a show, party, and fundraiser to help cover travel and lodging costs for the poets. It’s all happening at The Royal Room in Seattle. Doors at 7:00pm, show at 8:00pm. Advance ticketing only. If you were thinking that Seattle’s annual Labor Day weekend festival, Bumbershoot, is strictly about music, here’s a surprise: Bumbershoot also stages Words & Ideas. This year’s lineup includes talks, discussions, panels, poetry slams and some of the big lights in the Northwest literary scene. The Write Riot Slam is back, this month with a special guest “all the way from the distant land of Spokane”…Mark Anderson. You can hear Mark slam this Thursday, March 19, 2015, at 8:30pm, at Honey Moon in Bellingham. Get a Mark Anderson preview on YouTube. Read more about Write Riot here. Have a look at Monica Spain’s short article and KPLU sound clip describing a poetry slam that gives voice to both Seattle Pacific University students and residents of the (for the moment) on-campus tent city. Bellingham’s iDiom Theater is starting some late-night events and one of them is a series of poetry slams. On the last Friday of every month, Tobias Childs will host the Jazz Jam and Poetry Slam, reviving a series started by Glenn Apollo Hergenhahn-Zhao more than a decade ago. This triumphant return will include a live jazz band from WWU, a featured poet each month, and a cash prize! 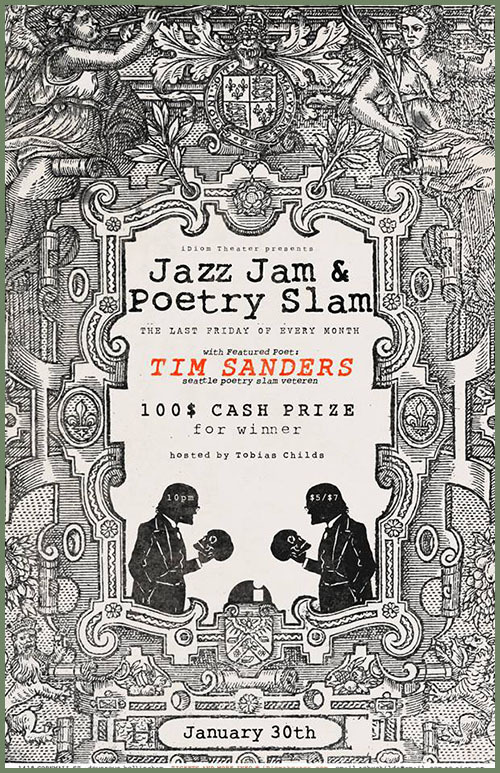 On Friday, January 30, 2015, Jam and Slam features Tim Sanders, a Seattle-based poet, playwright and graphic designer whose writing and designs have appeared in The Stranger, HENHOUSE magazine, ACT Theatre, Yes! Magazine, and 826 Seattle’s Greenwood Space Travel Supply Co. His works for stage have been produced in Seattle, Chicago, New York and other places unknown to him. He also helped put on the original Jazz Jam & Poetry Slam with Glenn and others. 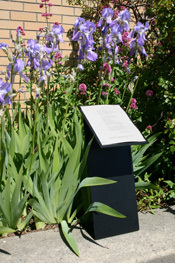 The JJPS will offer a $100 CASH PRIZE to the winning poet who, along with the runner-up, also receives a spot in the coveted Grand Slam Finale on April 17. 8 poets, 3 rounds, 1 Tim Sanders & 1 Winner who, as customary, is chosen by the audience. There is a student discount and also still slots available if you want to try and compete for the 100 big ones. See more on this and other iDiOM late night events on Facebook.